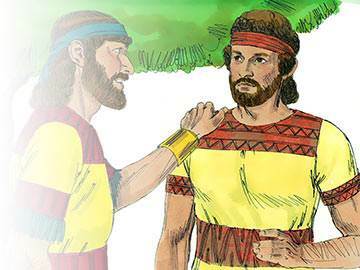 Jonathan was the oldest son of King Saul, and in human terms the heir apparent to Israel’s throne. He was endowed with great mental ability, high and noble morality, a handsome appearance and a heart of love. That God should have other plans than to bring Jonathan to the throne of Israel is accepted with grace by this man of great course, fidelity and unselfishness. These winsome characteristics all find their source in his unwavering faith in the God of Israel. Caught up in the perpetual skirmishing between the Israelites and the Philistines, Jonathan prepares to attack one of the enemy outposts, and says to his armour bearer: “Nothing can hinder the Lord from saving, whether by many or by few” (v. 6, NIV). Although just two lonely fighters, they emerge unscathed from a fight in which twenty Philistines are killed. Here’s an exercise that should do you a lot of spiritual good. Take Jonathan’s statement in the passage you have read today—“Nothing can hinder the Lord from saving, whether by many or by few”— and meditate upon it until you have drained it of every precious drop of spiritual refreshment. We’ll be surprised if it doesn’t change your day. Having demonstrated his faith in God and his great physical courage, Jonathan’s standing is now high among the Israelites—but he must now demonstrate moral courage too, for he has to serve under a very unstable father. A confusing battle follows Jonathan’s initial attack upon the Philistines, and again the Philistines are routed. 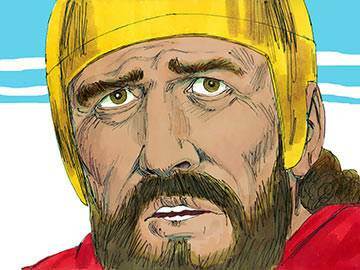 Saul issues a rash order that none of his men should eat that day while pursuing the enemy. 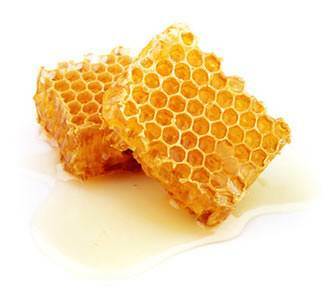 Jonathan, unaware of this order, eats some of the honey which surrounds him. When told of Saul’s order that no food should pass their lips during the foray, he bravely speaks out against it. By the casting of lots, Jonathan is then singled out as the one who has disobeyed the king’s order, and Saul sentences him to death. Popular support for Jonathan, however, prevents the execution. 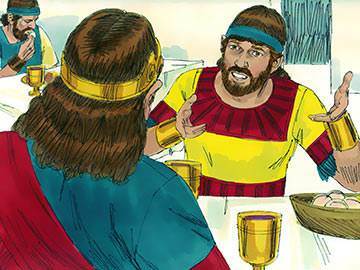 Why did Jonathan disapprove of his father’s order to fast? Quite simply, because he sensed that on this particular occasion it was not a divine command, and was therefore unnecessary. A lot of legalism would be emptied out of the Church if we could emulate Jonathan’s dedicated and sensitive spirit. Jonathan and David first meet in Saul’s presence when the shepherd boy is presented to the king after the conquest of Goliath. An immediate bond of love is forged between David and Jonathan—a love which endures right up to the moment of Jonathan’s untimely death in battle. Jonathan presents his robe, military dress and weapons to David as a public mark of honour and respect. David behaves wisely at court, and rises rapidly in the army and in popular esteem. This, as we have seen, causes Saul to become exceedingly jealous of him. 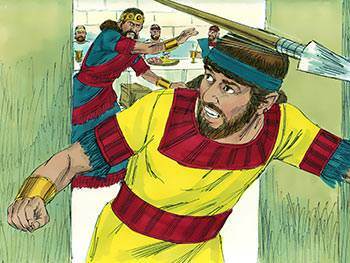 While David plays to him, Saul twice hurls his spear at him but David escapes unharmed. 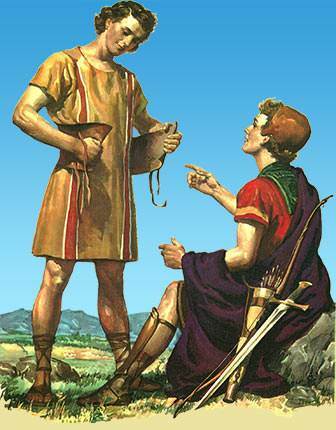 Jonathan quickly realises that he faces a conflict of loyalties, and that he will require all the skill and diplomacy of which he is capable to maintain his loyalty to his father and his friendship for David. Not many can stand between two people who are distanced by strife, and retain a loyalty and love for both. But Jonathan was such a person. In New Testament language, he would be described as a ‘peacemaker’. Could this description be given of you? 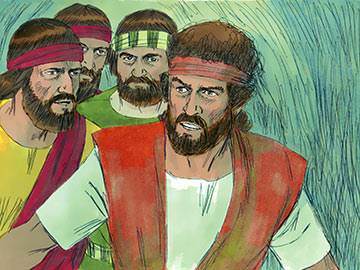 Saul instructs Jonathan and the courtiers to kill David, but Jonathan warns him to go into hiding while he reasons with his father. 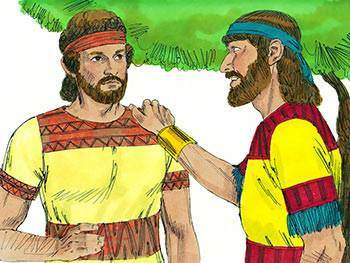 Jonathan points out to Saul that David has done nothing but good for the king, and that he had risked his life to kill Goliath. 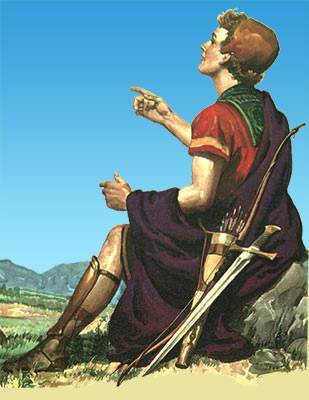 Saul heeds the words of his son and swears that David will not be put to death. 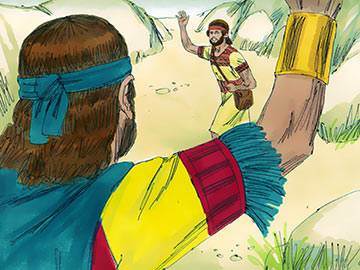 Through Jonathan’s intercession, David is able to return to the court, but it is not long before Saul’s jealousy is aroused yet again, causing David to flee for his life. David seeks out Jonathan’s help in overcoming the problem, but Jonathan does not really believe that David’s life is in danger. He agrees to speak to his father once again, but Jonathan’s public defence of David at a feast results in Saul hurling a spear at his son also. 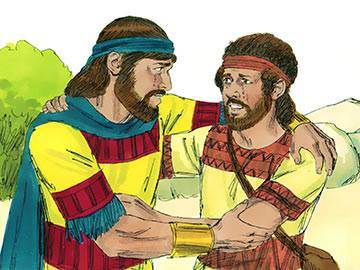 David and Jonathan decide with great sorrow that they must part, and together they reaffirm their oath of friendship. The friendship of David and Jonathan is one of the most beautiful and pure relationships the world has ever seen. But how it pales beside the love of Christ for His redeemed people. Can you think of a few comparisons? Here’s one to start you off: their love had a beginning—His love is from everlasting. Now think up some more. 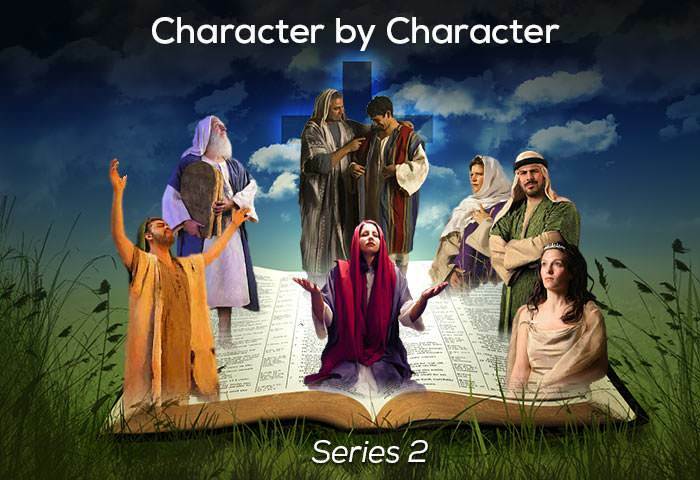 David is forced to become an outlaw, and gathers to himself in the cave of Adullam a band of faithful men. One of their exploits is to save Keilah from a Philistine attack. When Saul hears of this, he prepares to descend on Keilah, intending to trap David in the walled city. David, however, has enquired of the Lord, and has learned that the inhabitants of the city will hand him over if it is besieged. David and his men then take to a nomadic existence in the desert of Ziph, and Jonathan seeks him out to encourage him in the Lord. The message that Jonathan gives to David is one that is very simple, but heartening: “Don’t be afraid… My father Saul will not lay a hand on you. You shall be king of Israel…” (v. 17, NIV). David and Jonathan again renew their covenant of friendship as they part for the last time. What a difference a word of encouragement makes when someone is caught up in the midst of doubt and uncertainty. Ask God to help you come in contact today with someone who needs a special word of encouragement. And when you meet them, be sure to pass it on. May God guide you to the right person at the right time. It has been said of Jonathan that “he is the most chivalrous figure in the whole of the Old Testament, the flower and crown of Hebrew history, a knight without reproach”. The Scripture, which we know to be open and honest concerning the lives of its personalities, has nothing negative to say about Jonathan. From first to last, there is not one crooked line or dark spot in his conduct. Jonathan is the perfect example of a good and godly friend, and this, no doubt, is the main lesson that we observe from his life. He could take second place without jealousy or a spirit of rivalry, and maintain his love and loyalty for David despite everything that worked to the contrary. No wonder when David looks back and remembers the friendship of Jonathan, that he weeps and cries out: “Your love for me was wonderful, more wonderful than that of women” (2 Sam. 1:26, NIV). Have you a friend like that? Then consider yourself greatly blessed. But perhaps what is more important is this—are you a friend like that?